“Have a magical day!” is what more than 1,200 industry professionals from across North and South America heard after checking in at Disney’s Contemporary Resort in Orlando, FL for the 18th annual Transitions Academy. And with that one phrase, the tone was set. 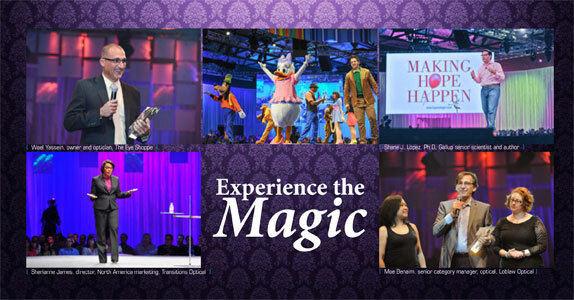 The three-day, invitation-only event revolved around the theme “Experience It!” and aptly began with a welcome reception featuring a capella singers and beloved Disney characters. Monday morning’s educational track kicked off with keynote speaker Shane J. Lopez, Ph.D, Gallup senior scientist and author of the book Making Hope Happen. Lopez spoke to attendees about creating the future they want through the contagious power of hope and encouraged them to “be the superhero of their own story”. Developing the “Experience It!” theme, the workshops offered strategies for working with change and dealing with customers, as well as using a holistic approach to personal and business health. A mix of hands-on technology experiments, activities and games livened the afternoon and provided the first-hand experience of wearing Transitions® Signature™ VII lenses. Not to mention offering the opportunity for some team-building and a little friendly competition! James was also the agent of more good news as she announced a sensational, high-profile collaboration between Transitions and Disney. “We couldn’t be more thrilled,” she stated. “Besides participating at various events here in Orlando, this partnership gives tremendous access to consumers not normally reached with another brand. And of course, Tuesday evening saw the much-anticipated Transitions Academy Awards ceremony, which honoured industry stakeholders in lab, retail, eyecare practice, eyecare professional, human resource and vision benefit broker categories. Wael Yassein, owner and optician at The Eye Shoppe in Oshawa, ON, was recognized for his outstanding efforts to promote eye health and brought home the Canadian Eyecare Professional of the Year award. Hope, education, activities, awards and Disney characters… have a magical day, indeed!